MRandall25 wrote: I'm drafting according to what I need to build my team, not necessarily "the best player". Whitney didn't fit what I wanted. Fair enough and ultimately what this is all about. You just figure that you'll want the best player available to make your team better...by the time you're "filling needs", the difference in player quality becomes almost negligible. The original Piece. Acquired October 90 for a pick, left for Boston two years later with two rings. Like a boss. In between he played 134 regular season and 43 playoff games worth of rock-solid if not unspectacular defense. Became the first American player to appear in 1000 NHL games along the way. Hm, I'd never have picked Binkley so early or at all under that premise. Sorry...and it's not really a big deal, because that can be weeded out at the end. From the OP: "Premise: We get X number of teams (I'd expect no more than 4 or 6 to be really into it) and we hold an all-time draft. In which you get 25 draft picks (serpentine) to build a team - thus, creating a de facto ranking of Penguins in history." Maybe I should have started: To create a ranking of Penguins in history, we'll hold an all-time draft. Hmmmm, by not drafting according to BPA though it allows for discussion on each team and the merits of the players drafted. I think it actually allows for more conversation that way mikey. Now MRRandall would have to defend his decision. Or anyone else for that matter. You pick up what I am putting down? 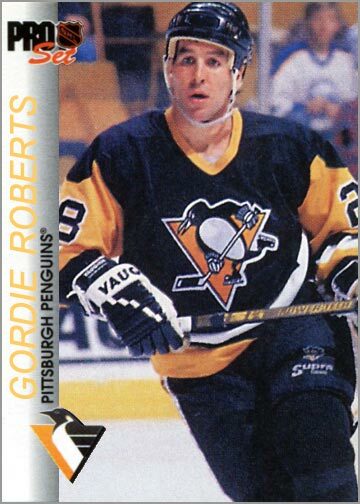 I gotta say that Gordie Roberts was not on my radar at all for this thing...it's a shame entire careers aren't factored in because he's quite underrated, but in terms of Penguins history, I'm not so sure, with all due respect. Rylan wrote: Hmmmm, by not drafting according to BPA though it allows for discussion on each team and the merits of the players drafted. I think it actually allows for more conversation that way mikey. Now MRRandall would have to defend his decision. Or anyone else for that matter. You pick up what I am putting down? I can dig it, Rylan. However, given that we are - in effect - creating the list for BPA with every pick we make (to my knowledge, this hasn't been done in any sort of research-based environment) shouldn't that be enough to generate discussion? It's not "who's the BPA? ", it's "this guy is BPA because..."
And to date, this hasn't gone anywhere close to coming off the rails or anything...some questionable picks? Sure. A bit of a goalie fiasco? Expected. Otherwise, I've been quite happy with how it's gone and have enjoyed it quite a bit. Oh, don't worry, it's all good. I still like my team. I have to admit the really difficult part for me is not so much comparing players from different eras (not saying it's easy, of course), but putting the length of their tenure into context. There are still a handful of defensemen available with 300+ games, so I wasn't sure if ranking Gordie Roberts ahead of all of them was really a sound decision. Edit: Just seen your last post, mikey. Yeah, I get your point. Then again, he was a big part of two Cup winning teams. Defend my decision to draft Slegr ahead of Whitney and Mantha? I have Paul Coffey and Zarley Zalapski, so I figured I needed someone a little more defensive minded. There's probably better on the table (that I found after I had read around after my choice), but the player I was originally going to take there (Scuderi) went right before I picked. I'm definitely more aware now, and really, until the Scuderi pick, I hadn't even really thought to look at recent (i.e. post-lockout) players. Gaucho wrote: Oh, don't worry, it's all good. I still like my team. Oh believe me, even with some experience with this in general, I'm having trouble with the juxtaposing of "peak" vs. "longevity" - I broke and took Moe Mantha recently with the claim "I can't ignore that peak season any longer" I agree that that's been the hardest part for me, as I'm fairly used to comparing players throughout eras for other projects that I've done/participated in. Interesting, for some reason I was quite certain that he was way ahead of [undrafted] and [undrafted] in TOI. Maybe not a smart pick after all, but you live and you learn. Gaucho wrote: Interesting, for some reason I was quite certain that he was way ahead of [undrafted] and [undrafted] in TOI. Maybe not a smart pick after all, but you live and you learn. Wow. Pick #60 already. Crazy. Probably one of my favorite pics of all time. He's definitely giving the Zoolander blue steel face there. Originally a throw in in the Marian Hossa deal, Dupuis has turned into a viable top 6 option (as viable as it gets on a cap strapped team). Last year, he had career highs goals, assists, and points. Dupuis also has 7 SHG in the past two seasons, providing terrific defense and also giving other teams something to think about while running their powerplay. At this point in the draft, I'm getting a defensively responsible player who can play a role on any line. 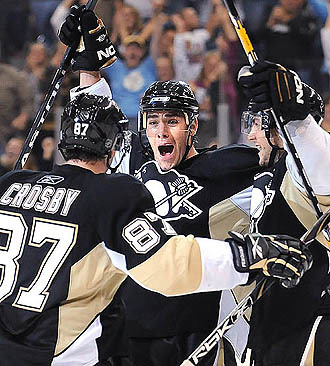 I'm perfectly comfortable with Dupuis rounding out my top 6. An offensive defenseman, Tarnstrom scored career goals, assists, and points, first in 02-03 season and then surpassing it in the 03-04 season. Tarnstrom lead the team in points in that 03-04 season, and while he wasn't the best defensively, he played in all situations. I figure I can shelter his minutes with Carlyle and Stackhouse, while also giving him some PP time. Last edited by Gaucho on Wed Dec 12, 2012 8:27 am, edited 1 time in total. I have a few wingers left on my board, no need for James Neal. 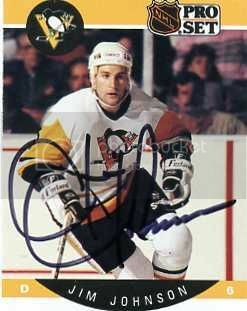 A good defenseman that could kill penalties and that posted a positive +/- 3 of 4 years with the Pens. I don't usually like +/- but it does give you a general idea of how the player did.